Home Blog Is My Garage Door a Safety Hazard? No one actually thinks of their garage doors as potential hazards or source of danger. They are rather seen as a convenient fact of life tool to help us lead comfortable lives. In fact, they are in general not given a lot of consideration until they stop working or performing properly. Still, in some cases, garage door systems can become a source of danger. They consist of a great number of parts and any problem related to them, from improper installation to wear and tear, can increase the risk of a hazard over time. Quite often, accidents related to garage doors come from a complete absence of maintenance or a poor installation job at the start. It is vital to understand that these mechanisms ought to be checked, tested and serviced often. Asides from being complicated electro-mechanical systems, they are also very heavy. 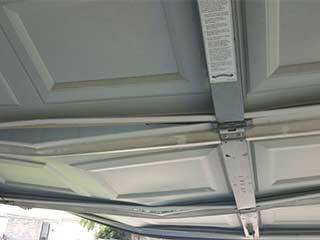 How many times have you heard about garage door springs snapping all of a sudden? Well, actually they hardly break out of the blue. These parts all have limited lives and will show considerable wear before they snap completely. Meanwhile, though, lubrication maintenance and professional tension adjustments from time to time will help them to last longer. Most accidents happen when homeowners try to fix complicated problems on their own. If you go online and type in the search box “how to repair damaged garage door tracks”, you'll get hundreds of different answers. Sadly, none of these will give you the know how to be able to perform this kind of repair safety unless you've had the proper training. Your garage entrance may also become the source of potential security hazard if it's unintentionally left open or left unlocked. This is why we always recommend rolling code technology and openers which sync with your smartphone - this way, you'll limit the risks of intruders accessing your property and be able to control your door from a distance in the event it does get accidentally left open.